Pack size: 1x 360ml bottle and lens case with neutralising disc. AOsept Plus HydraGlyde, from Ciba Vision, ensures your lenses are perfectly clean and comfortable, locking in moisture to keep you free from irritable dry eyes. 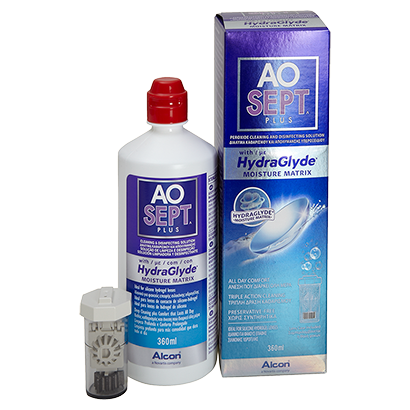 AOsept Plus HydraGlyde combines the power of a hydrogen peroxide solution and Ciba Vision’s own HydraGlyde technology to form a solution that perfectly cleans your lenses and locks in moisture for all day comfort. Because there are absolutely no preservatives in this peroxide solution, you can be sure your eyes will remain completely free from irritation. AOsept Plus even contains its own improved protein-removal technology, to help keep your lenses perfectly clean no matter where or when you wear them. The HydraGlyde Moisture Matrix technology allows the solution to embed itself on and within the lens surface. This allows moisture to properly surround the lens, providing your eyes with the hydration they need to stay comfortable throughout the day. Each pack of AOsept Plus contains one 360ml bottle of solution and a lens case containing a neutralising disc. Simply ensure your contact lenses are totally submerged in solution and leave them in this lens case over night for perfectly clean lenses, ready to wear without rinsing or rubbing.